Fabrice Fiteni cooked up this colorful, psychedelic treat at Supinfocom. P.S. If you enjoyed the attached you’ll probably love The External World, too. Some bizarre holiday horror from Sir Cyriak...Merry Christmas!! 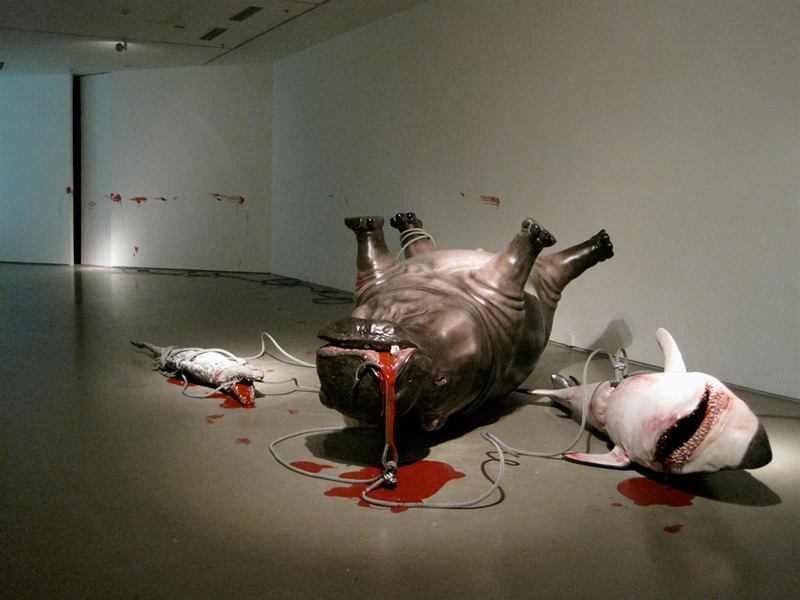 A potent dose of bizarre courtesy of Emanuel Strixner. Enjoy! This bizarre, gorgeous short created at Supinfocom Arles by Paulin Cointot, Dorianne Fibleuil, Antoine Robert and Maud Sertour is packed to the gills with gobs of subtle, pleasing visual detail. Full-screen is a must. ENJOY! P.S. Our Supinfocom feed is pretty rad, you should definitely check it out. A surreal-silly-psychedelic-good-times romp created at Blink for Adam Buxton‘s new ‘comedy-meets-music-video’ series, BUG, on Sky Atlantic HD. Best served at the height of your sesh in full-screen HD. This one’s a treat; ENJOY! P.S. The Layzell Brothers (who illustrated/animated/directed the attached) are also responsible for the super-bizarre Reindeer and om-y 8-Bit Mazes so give those a gander when you’re done here. Beach House has a just-out-of-reach enigmatic quality to their music; I don’t ‘get’ what they’re trying to say but then I do…kinda. I’m OK with it – I’ve never needed meaning to be force-fed down my gullet (in fact, I prefer the opposite) – and their tunes often leave an aftertaste of mystery that never quite resolves. In those moments the lack of lyrical clarity is preferable; it frees me to power-down the analytical modules of my brain and relax into the pure ethereal atmosphere of their instrumentation. Allen Cordell, who directed the attached, seems to get this too as he’s peppered the whole affair with oblique, mysterious visuals that fit together in style and tone but not much else. It’s bizarre in the best of ways, a fitting first course for a late-night, solitary sesh. What are you waiting for? Get in there. Bizarre, polygonal visuals from Marco Morandi set to some ethereal, atmospheric tunes by Ninca Leece. Thanks again, internet! The first thought that popped into my brain after watching the attached: I want to go to there. The second? 2veinte should develop this into a 30 minute show. No dialogue, no traditional story arcs; just weird, bursting-with-candy-color visuals backed with arcadey, reminiscent-of-a-Casio-keyboard-demo-mode tunes. WHOWOULDN’TWANTTOWATCHTHATAMIRITE?? 2veinte is giving away free Psychic Land posters to fifty random fans of theirs on Facebook. They don’t seem like the constantly-spamming-your-newsfeed-type so if you want a chance to win some rad art for your wall you might want to head on over; the effort-expended-to-possible-reward ratio skews generously in your favor. Oh, and be sure to check out Let’s Face Symmetry – also by 2veinte – which we posted back in August. This animated short from Clement Picon, Amael Isnard and Manuel Javelle is infectious, high-energy and contains heaping doses of bizarre. Resistance is futile. Just let go. Put it in the pizza! Hungry? Got the munchies? 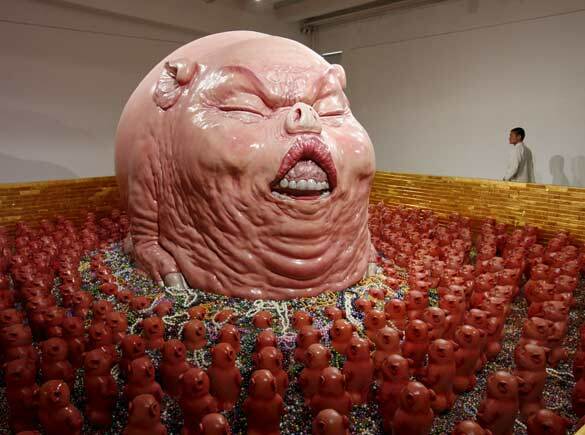 Want to visit the ninth circle of hell? You’re in luck! 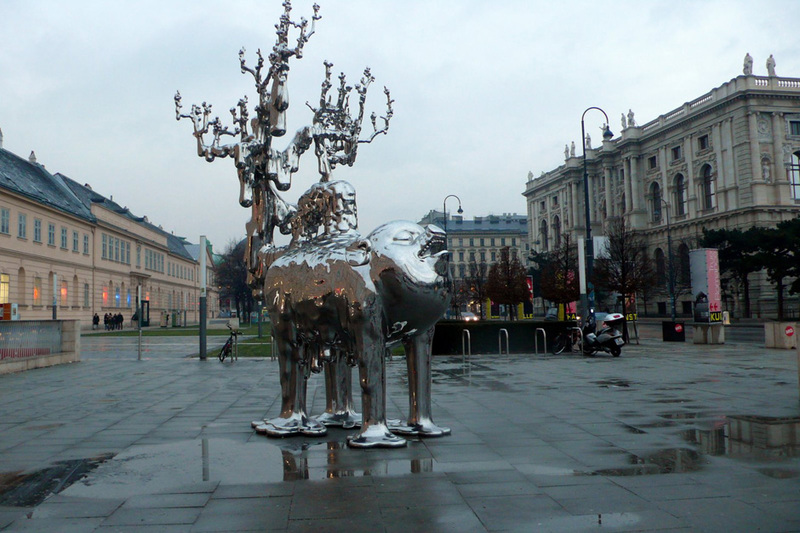 Chen Wenling is a contemporary Chinese sculptor currently based in Beijing. 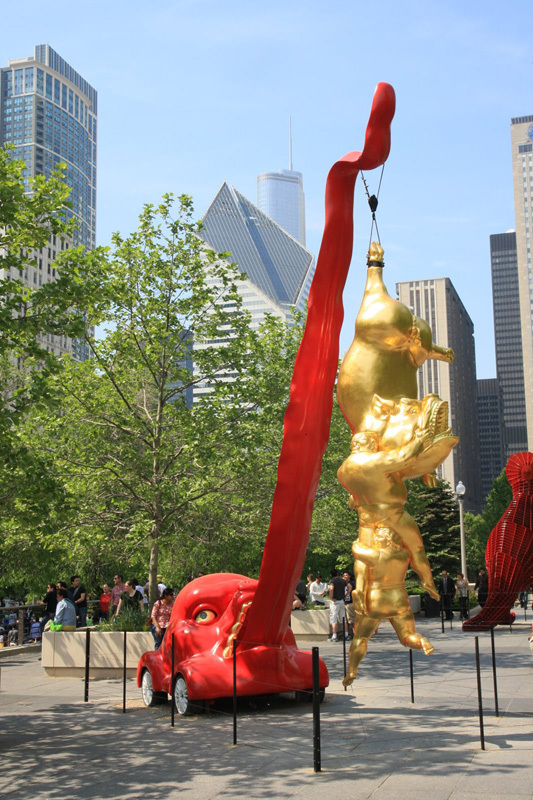 The sculpture above – entitled ‘What You See Might Not Be Real’ – was created in response to the global financial crisis. 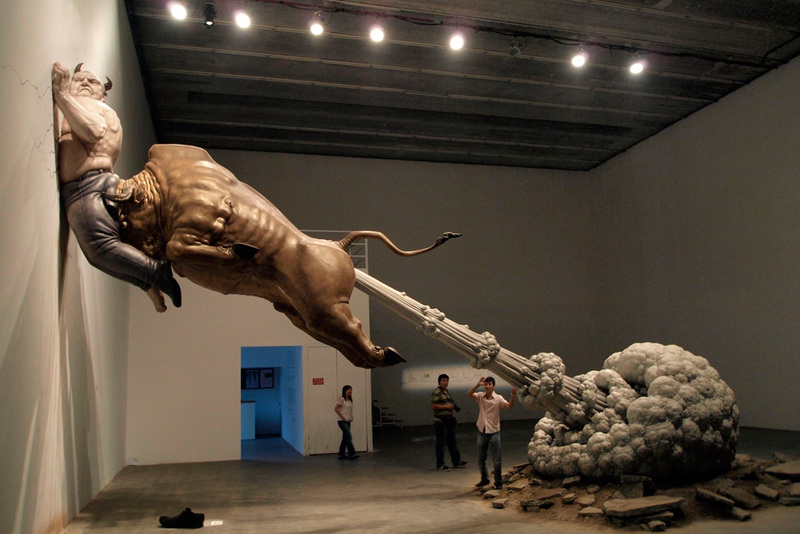 The bull represents Wall Street, while the devil pinned to the wall portrays Bernard Madoff, operator of the largest ponzi scheme in history. 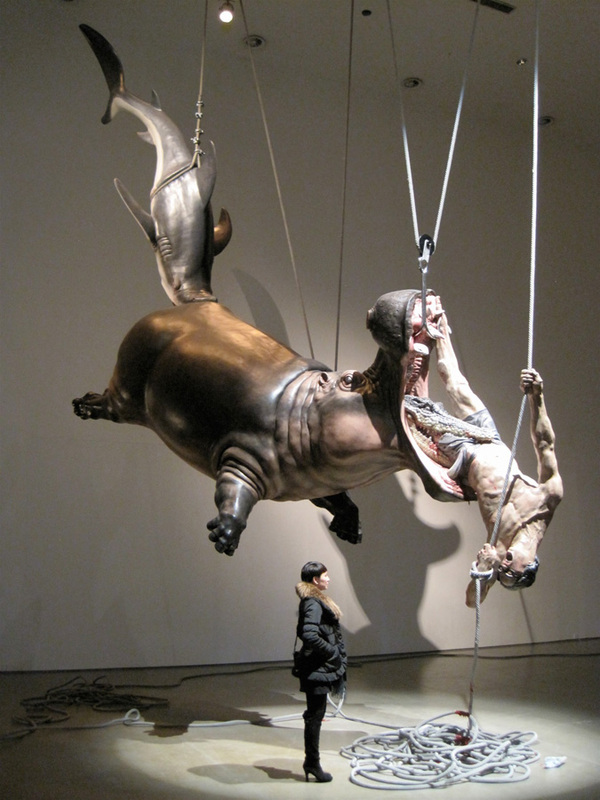 I love not only the imagery and subject matter Chen tackles but also the scale on which he creates it. In this case, bigger is definitely better.